A few weeks back, I presented on an eG Innovations webinar on the topic “Is Citrix Cloud Enterprise Ready? Best Practices to get the Most Out of Citrix Cloud Deployments”. Citrix Cloud deployments are growing in the industry and as organizations begin evaluating their cloud options, Citrix administration teams want to understand how Citrix Cloud can will sustain, scale and be supported in lieu of on-premises Citrix deployments. What are your recommendations on the ideal size of customers moving to Citrix Cloud? Prior to September 2018, I would have said small/medium-sized companies, so maybe up to 500 users. But, post September, the new features released are targeted at enterprise-customers. Key new features such as Local Host Cache, Delegated Administration and Configuration logging are now generally available on all instances of Citrix Cloud and will particularly benefit enterprise customers. One point to highlight is the Citrix Gateway Service. Enterprise customers will want to manage this in-house based on security requirements. Does Citrix cloud support Microsoft App-V integration? No , there is currently no App-V Integration through Citrix Studio in Citrix Cloud. Full Infrastructure, SCCM or App-V-Scheduler can be used to deploy App-V Apps on the VDAs and still published though Citrix Virtual Apps. What would you say is the biggest roadblock to Citrix Cloud adoption today? Justifying additional expense of Citrix Cloud licensing. This is not comparing apples for apples. There are unseen benefits of using a cloud service such as speed of delivery vs. a traditional model. This is not often seen if you just compare the price of Citrix Cloud vs. deploying on-premise. Additional business case justification is possibly required to quantify the other benefits. Lack of skillset in working with Citrix Cloud: Although the management consoles and general configuration in Citrix Cloud is not hugely different, it is still very hard for Citrix admins/existing Citrix customers to get access to evaluations/trials of Citrix Cloud . Primarily this is because of cost to Citrix for standing up the evaluation instance in Azure vs. a time-limited license key traditionally handed out on customer’s infrastructure. Fears of security/compliance: Questions often asked include “What is stored in Citrix Cloud?”, “How does it affect country data?” etc. Citrix Cloud has been deployed now on the following regions: Americas, European Union, and Asia Pacific and Japan. Metadata is only stored in cloud and therefore data always remains under the customers ownership. Security/compliance concerns are really unfounded in my opinion. Azure SLAs do not meet your requirement. In this case, you probably need to review your reasons for deployment in the cloud. How is Citrix Cloud licensed? What are the differences with on-prem deployment? Citrix Cloud is licensed on a subscription-based model. Licensing is per-user per year, and you will get the best pricing if you commit for a 3-year term. Virtual Apps & Desktop Service is the direct match to the on-prem deployment, but like on-premises there are options for workspace bundles in the cloud to include other services such as endpoint management, Citrix files etc. Are they any functionality differences between monitoring Citrix on-premises and cloud? From a Citrix Director point of view, there is no difference. Monitoring the Citrix Cloud connector & backend Citrix cloud infrastructure is not provided out of the box and is only provided by using an external dashboard and notification setting is via subscriptions. But this gap can be filled by using eG Innovations’ solutions. Using eG Innovations, you can fully understand the end-to-end communication chain and see if the connection to cloud, or a database connection with the cloud has failed. What cloud service providers are best for Citrix Cloud? AWS/Azure/GCP? There is no right answer to this question. This is either driven by a larger strategy to prefer a certain cloud vendor or solely based on price in which case you need to compare the specific VM requirement/configuration between all three major cloud providers (Microsoft Azure, Amazon AWS, Google Cloud) and then select the most cost effective. An example would be that one provider may offer GPU based VMs at a lower cost than another, but another cloud provider offers lower spec VM at a better rate. It should be a task per quarter to review if the cloud provider you have chosen is offering the best value for money and adopting a multi-cloud strategy ensures no one provider is solely responsible for all workloads and gives you the most flexibility in changing providers based on the business demands at any given time. But there are costs required to established highly resilient links to these providers and therefore you’ll not always have the luxury of that choice of multiple cloud provider in reality. In my dealing with Citrix Cloud, here is my order of mostly used cloud providers (but this is my own opinion). Is Citrix Gateway included in Cloud Subscription? Yes, there is a Citrix Gateway Service included in your Cloud Subscription. It allows 1GB per user per month and additional top-ups can be added to the subscription if your usage goes above this limit. Which workload is most cost effective (VDI vs Hosted Shared) being hosted on Cloud? VDI have a 1 to 1 relationship, therefore the cost per user is the total of time that the VM is powered. Alternatively, shared hosted desktop will have multiple users per VM and the cost per VM can be spilt across users, and this will make it look more attractive. F16s_v2 is the most cost-effective shared desktop VM on Microsoft Azure based on number of users/costs of VM. But a word of warning that the more people on a VM, the harder it will be to unload the users to save VM costs in the long run. D2_v2 would be the next best Azure VM for shared desktops. Does Citrix Cloud provide Multi-factor authentication (MFA)? It is being released very soon for Netscaler Gateway Service, alternative as I previously called out large enterprises tend to have their own Citrix gateway appliance then this is already possible. Is NetScaler Gateway in the Citrix Cloud included with the Citrix Cloud license? Yes, it is already included in the Virtual Apps & Desktop Service subscription. Does NetScaler in the Citrix Cloud support NetScaler VPN? No, it is only a Gateway Service which only does the ICA Proxy function. Can you use Citrix cloud with physical on-prem NetScalers/ADC? Do you just point the virtual StoreFront to the cloud StoreFront servers? Yes, you can use on-prem NetScalers/ADC with Citrix Cloud. You need to point your STA to the Citrix Cloud connector on your resource location. You’ll need point your on-premise NetScalers/ADC to On-premises storefront servers which will then broker the connection via cloud connectors to Citrix Cloud to retrieve your allocated resource. Is Citrix Cloud appropriate for a VDI environment used for 3D applications and desktops? What is the impact on performance and bandwidth required? Citrix Cloud is appropriate for VDI due to the fact that it is the location of the VDA or specification of the VDA VM which will really dictate your experience for 3D apps rather than the Citrix cloud service itself. For 3D apps, having a GPU installed on server/VM would be essential to provide adequate performance and seamless experience. In relation to bandwidth, I have seen some recent analysis of AutoCAD as an example taking about 500kb per user. Are there plans to offer XenApp Delivery Groups in the public cloud? Delivery Groups can be on-premises or in the public cloud, so it is currently available at the moment. What about possible product bugs and the installation of required patches? What is the SLA for Citrix Cloud? Citrix Cloud has an SLA of 99.5% monthly Uptime. As it is hosted in Microsoft Azure, it will only ever reach this figure. When LHC (Local Host Cache) is Active say, for example, due to a local internet issue, the LHC will then run on the infrastructure hosted by the customer, and the SLA of this infrastructure would apply to the service which is outside Citrix’s responsibility. What about RADIUS based MFA limitation for Cloud Services? As per previous question, MFA for Citrix Cloud is being released very soon. Are there any latency considerations that need to be taken into account with Citrix Cloud as it is a hybrid solution? A high-speed reliable internet connection with some quality of service is recommended for traffic to Citrix Cloud to ensure no brokering issues due to network traffic. The traffic passed between Cloud Connector & Citrix Cloud is only single digit Kb therefore the faster it sends, the quicker the respond with the resource. Comparing against an on-premises solution there is possibly on 1-sec difference in the time it takes to establish the connection. Does the Citrix administrator have access to Citrix infrastructure servers like Delivery Controller, Director, Studio, etc. while they are being managed by Citrix Cloud team in the control plane? No, Citrix Cloud provides this as service. This includes access to Citrix Studio, Director but not the backend servers directly. Can I integrate with Azure Active Directory for Two Factor Authentication (2FA)? Yes, Azure AD is an authentication mechanism for Citrix Cloud. You’ll need to deploy FAS on your resource location to have a seamless passthrough of authentication to VDA otherwise after launching application/desktop you’ll be prompted for credentials. Does Citrix Cloud provide HA/DR? This is covered by Microsoft Azure infrastructure and the service will be available with 99.5% availability irrespective if it is in DR or not. 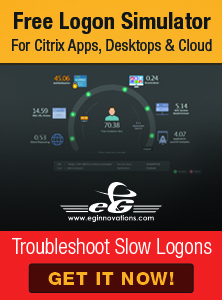 Smart Tools feature is not working which is informed by Citrix. So any idea on the same when it will start working? Citrix Smart Tools help maintain operational health and availability of Citrix Virtual Apps and Desktops environments. Since Citrix Cloud is now providing you with the infrastructure & instance, they are managing the health and availability of your Citrix Cloud Site. I would not expect this to be made available for Citrix Cloud as they provide the guarantee on the service. How can I size network bandwidth from users to Citrix Cloud and from users to Azure Cloud? Would you recommend any per-user benchmark (IOPS, network bandwidth, etc.) based on your experience? Although as it stands, here is what the calculator has by default. How easy is it to revert back to an on-premise model from Citrix Cloud? Change the VDA from Cloud Connector to your Delivery controllers. From a licensing perspective and termination of contract on Citrix Cloud it would be a lot harder. My advice would be to get a POC to test and ratify any concerns on Citrix Cloud in your specific environment before making the jump. Will I have same level of tech support from Citrix for Citrix Cloud as I get for on-premises services? Yes, you can log incidents & support calls directly via the Citrix Cloud administrator’s logon page. It will be looked at and resolved like any other ticket and engage with their own internal Citrix Cloud teams on any info required from that specific instance. Is the Citrix Cloud Connector a virtual device? Can I have HA configuration? It is a standard Microsoft Windows server, deploying 2 cloud connectors is recommended per resource location to ensure you have a HA solution. No load balancing as Citrix Cloud will distribute load to Cloud Connector through its own algorithms. If deploying Citrix Storefront/network on-premises, then you need to point to multiple Cloud Connector to ensure HA. Would you recommend any best practices for Server and Desktop VDA sizing and storage sizing in Microsoft Azure? Server VDA – Go with F16s_v2 for high users and most cost effective if you have a very regimented Start & End Time for users as there is a high density of users per VM. If you have a flexible working environment the most cost effective will be D2_v2 as this has lower number of users per VM and more will be able to shutdown during times of low usage. Desktop VDA – This really depends on your specification but the cost per VDA. But D2_v2 also would fit with Windows 10 minimum specification.